Can you believe we&apos;re saying goodbye to 2015 tomorrow? 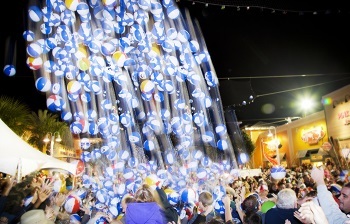 The New Year&apos;s Eve Beach Ball Drop is the perfect event to ring in the New Year! The eighth annual event is held at Pier Park and is full of activities from concerts to beach ball drops...and of course, fireworks! The family celebration starts at 5:30pm with the Barry Fish Band concert, followed by a laser and light show. At 8pm, 10,000 inflatable beach balls will fall down on Pier Park Drive. More concerts trail the ball drop with American Tread preforming at 8:15pm and Celebrity All-Stars at 10pm. The night will finish off with a giant LED-lit beach ball lowered to signify the New Year, accompanied by fireworks. Just because we are in Panama City Beach doesn&apos;t mean we can&apos;t play in the snow! Four machines will be blowing out snow for that winter atmosphere. Vendors will feature a variety of local businesses, and many will be offering games, food, and New Year&apos;s Eve swag (come to the Visit Panama City Beach tent for a free New Year&apos;s hat)! This free and unique event draws in tens of thousands of visitors, so be sure to plan accordingly. Parking is plentiful, but will be more ideal the earlier you arrive. Parking is available throughout Pier Park and also at Pier Park North. Pier Park stores will be open until 10pm with select shops and restaurants staying open later. Be sure to check out our page here for New Year&apos;s Eve specials and a full schedule of events! Michaelean joined Visit Panama City Beach in 2015, but has lived in Panama City Beach for most of her life -- She's an expert!